ArtPrize is over and the Plan B town has been dismantled for going on two weeks now but it seems like just yesterday the whole crew was cracking acorns, jamming to great music and talking around campfires. I have to admit that it took me personally at least a week to get used to a home-life again that didn’t consist of quick showers and running back to Ah-Nab-Awen Park. Part of why I wanted to write today was to give a belated but heartfelt THANK YOU too all of the people that helped to make Plan B happen. There were many businesses throughout Grand Rapids that donated food and goods also, Marie Catrib’s, Ada Bike Shop, Rowster’s Coffee, and Coat of Many Colors are a few that I’m sure of. Maybe my fellow collaborators can chime in here with some other names. If I haven’t listed you, please don’t feel unappreciated! Everyone who gave of themselves to make our project happen was felt in the warmth of the project and continues to have our thanks. The second reason for this post is to let everyone know that Plan B is not over! As a community of friends who grew beautiful relationships this past summer, we are going to keep meeting and see where we can take the ideas and concepts of Plan B next. We are all very much interested in creating a more powered-down and sustainable future for ourselves and our communities and we’re always welcoming new and interested folks into our Plan B Family! We have met twice since the end of ArtPrize and already the talk of what might lay on the horizon for our group has begun. We met SO many people during ArtPrize that expressed interest in what we were doing and here is your invitation to please join us! We normally meet for a potluck dinner every Sunday evening at 5:30pm at the Beerhorst family’s home at 106 Fuller Ave. SE in Grand Rapids, MI. Please note that this Sunday is Halloween and we won’t be meeting Sunday but rather Saturday night at 7:00pm for movie night. If you are interested in joining us for some great food and discussion, please join us! If you would like more information about us, please email either Rick Beerhorst or myself. If you want Plan B Entertainment/Speaker/Demonstration information click HERE. If you want information on Donating Food or Cooking Meals for Plan B – click HERE. If you are looking for info. on the Plan B Parade/Processional, click HERE. If you are looking for info. about the Really Really Free Market at Plan B, click Here. If you want to look the part and dress in “Plan B Attire” click HERE for wardrobe inspiration. Plan B is Part of the world-wide “10-10-10 Event” find out about it Here. What is 350.org? 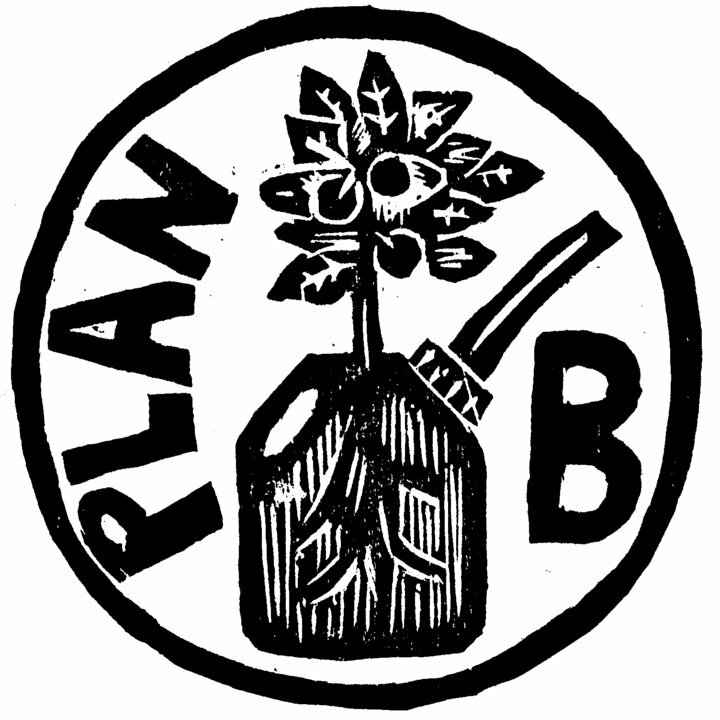 More General Info about Plan B is Here. Plan B at Artprize.org is here. I believe we are about to experience a very different future. Our culture is about to make a radical shift -the large % of our western population is not in the least prepared for. We were born into a world engulfed in the modernest love affair with efficiency as was typified by Henry Ford’s assembly line. We were quickly drowning in everything from Art Van furniture, Big Macs, divorce lawyers and credit car applications. We have gobbled up our natural resources at a dizzy break neck speed and we are just about to hit the wall. In fact we have hit the wall and we are now in that slow motion stretched out split second of crash dummy whiplash as home foreclosure rips through the cities and the suburbs and Wall Street tumbles into a sink hole of no return. America is the Titanic. The ship has already struck the ice. The gash has overwhelmed efforts to hold off the icy water. The ship’s captain, his personal valet and the chief engineer knew what would happen in the next two hours but the rest of the ships passengers are picking out their dresses and straightening their ties getting ready for dinner. 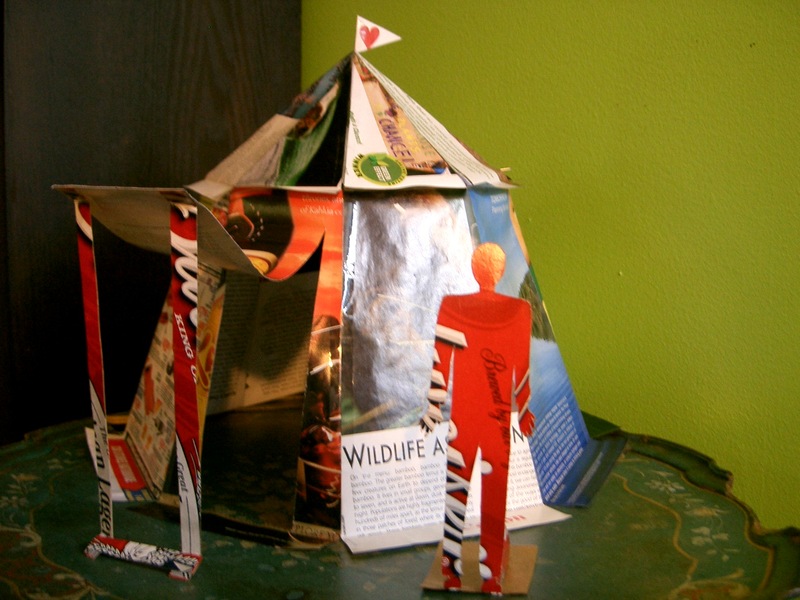 We are working with a team of people on an Art Prize project called Plan B. This will be a home spun eco village on the bank of the Grand River in downtown Grand Rapids Michigan in front of the Gerald Ford Museum from September 22-October 10. Sand and gravel water filters, a bicycle powered water pump, bicycle powered PA system for our performance stage, hand sewn tents made of used bill board vinyl, a puppet theater, black smith, leather worker, rocket stoves, chickens, rabbits, green house and container vegetable gardens…. We are seeking to create a powered down model of what our future could look like where technology is once again something regular people can tinker with and understand, a world where people not only work together but eat together and tell their stories. We want to create a place where we can become human again and hand off a culture to our children that has a future. Come and join us! 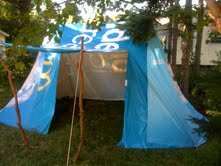 This tent measures about 10 feet high and 20 feet long. We left it up through a good storm and it shed the water and stayed put just fine. It is made out of billboard vinyl and is all hand sewn. The support posts are made from saplings and the tent stakes are made iron hand forged by our blacksmith Nate. Sunday, July 18th we will be meeting at Ah-Nab-Awen Park (our venue on the river by the GR Public Museum) for those interested! It is at 5:30 and still a potluck! All are welcome! 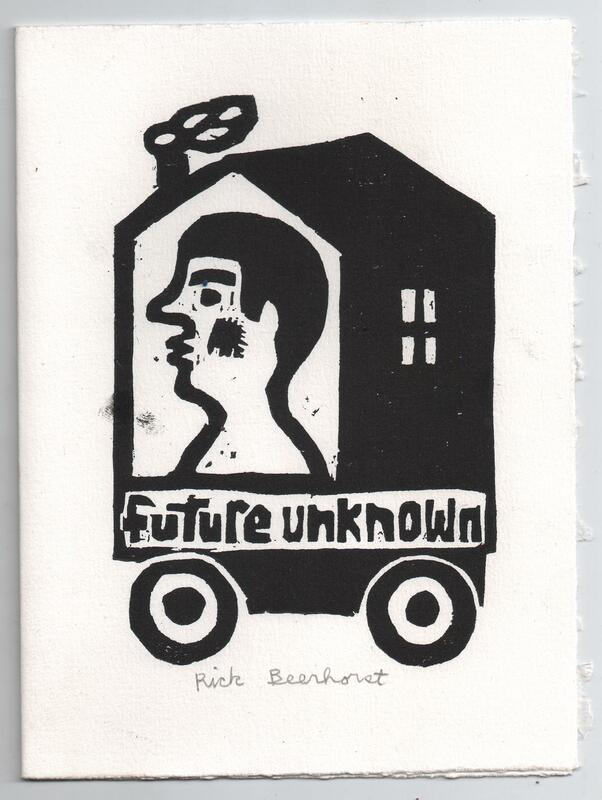 This just in folks, the Plan B ArtPrize team is now making a limited number of pin-back buttons available for purchase featuring a woodcut design by none other than Rick Beerhorst! 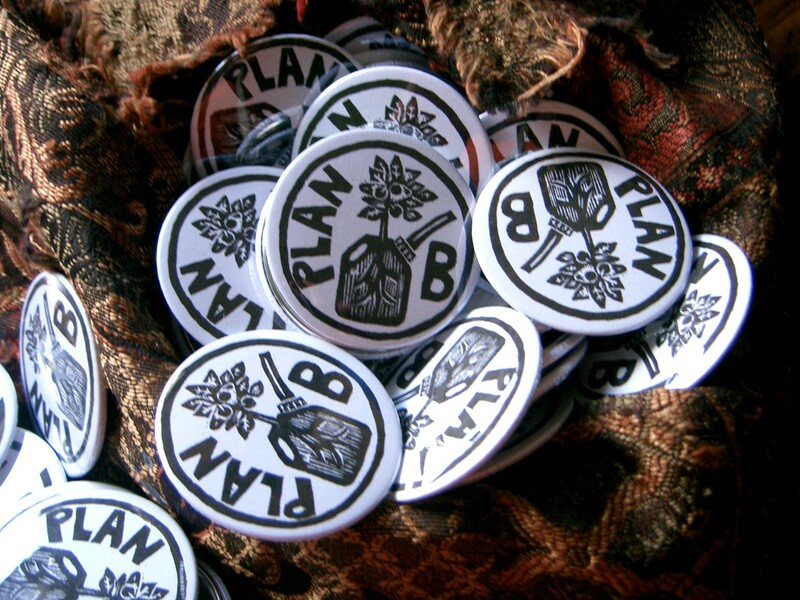 These beautiful 2.25″ buttons are being sold for ONLY $1 each with all proceeds going to fund the fabulous artistic vision of Plan B. They will be available at the Fulton Street Art Market every Sunday at the Wonder Wagon. Stop by and get yours while they last!